Located along six miles of Pacific coastline in northern San Diego County, Encinitas has an approximate population of 60,000 and is characterized by coastal beaches, cliffs, flat­-topped coastal areas, steep mesa bluffs and rolling hills. The city was incorporated in 1986, drawing together the communities of New Encinitas, Old Encinitas, Cardiff­ by­ the­ Sea, Olivenhain and Leucadia. There is a significant flower growing industry in the City and many people claim that Encinitas is the Flower Growing Capital. As the City has developed, it has grown up around the pre­existing flower growers. San Diego Botanical Gardens is a beautiful oasis to visit with an Amazon Rainforest and the largest display of bamboo in the world. The gardens of the Self Realization Center are beautiful and sit overlooking the ocean in a serene garden-­like setting. Golf enthusiasts will enjoy the Encinitas Ranch Golf Course, a championship 18 hole par 72 course with panoramic ocean views. Downtown 101 is a coastal shopping district over 100 years old featuring historic architecture, quaint shops, sidewalk cafes, and restaurants framed by beautiful flower baskets. The organizations Downtown Encinitas Merchants Association (DEMA) and the Encinitas Chamber of Commerce are a great resource for information on business in Encinitas. The beaches in Encinitas are outstanding. There are many stretches of beach that lie between Cardiff­by-the­Sea and La Costa. The surfing is unbeatable and many surf contests are held throughout the year in Encinitas. The San Elijo Lagoon Reserve is the largest coastal wetland in San Diego County and is home to nearly 300 different bird species throughout the year. 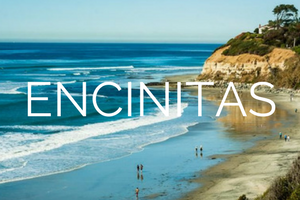 The natural beauty of our communities, along with temperatures between 40 and 85 degrees year round make Encinitas a spectacular place to live.